The FCC is offering class C or D AM stations a one-time chance to get an FM translator into your coverage area from up to 250 miles away. Available frequencies are limited in many areas and the industry is moving fast. Class A and B stations will be able to take advantage of this beginning in July. When planning, consider equipment that will help ensure you have a cost effective STL solution using inexpensive IP Radios and our Network EDGE, as well as audio processing for both FM and AM bands, designed to work specifically in this capacity. Network EDGE is designed specifically as a translator between high-quality, low-latency studio networks such as WheatNet-IP and low-bandwidth STL connectivity options such as IP wireless radios that are in the unlicensed 5 or 24 GHz range and priced from a few hundred to several thousand dollars. Our AM-55 AM audio processor is powerfully modern, yet affordable. Its intelligent five-band AGC, or iAGC, optimized for the AM bandspace, is why. This is the real deal for AM stations requiring bold, consistent sound. 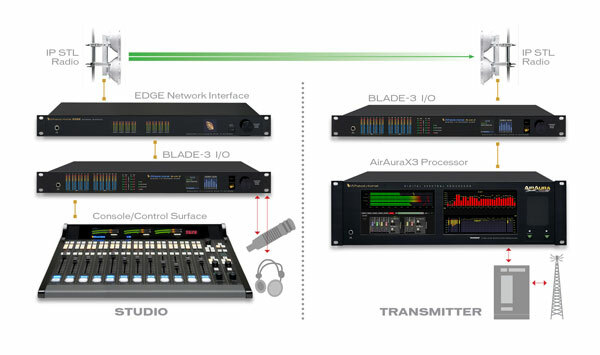 With BLADE-3s, you can really make the connection between your studio and your transmitter into a workhorse. Silence detection, associated connections, controlling/automating your processing - that just scratches the surface. Click Here for to learn all about what BLADE-3 can do!